Paul Schwartz of the New York Post examines some of the difficult decisions facing the Giants as the 2019 draft approaches. The Scouting Combine gets underway this week, and when New York GM Dave Gettleman speaks on Wednesday — which will mark the first time he speaks publicly since the end of the 2018 season — Schwartz expects he will formally commit to Eli Manning as the team’s starter for 2019. After that, though, the picture gets a little fuzzy. Gettleman would of course love to find Manning’s successor in the draft, but he eschewed high-end collegiate QB talent last year, and the quarterbacks in this year’s class are not as heralded. Gettleman has long maintained that he will not grade quarterbacks on a curve just because there is pressure on him to pick one, and the Giants have plenty of other needs to fill, so they will be one of the more interesting teams to follow in the next couple of months. In a separate piece, Schwartz looks at three players the Giants will be monitoring closely at the Combine, all of which fill one of their above-referenced needs: QB Dwayne Haskins (Ohio State), LB Devin White (LSU), and OT Jonah Williams (Alabama). Ryan Dunleavy of NJ.com says the team’s top priority this offseason should be adding defensive playmakers, and he takes a deeper dive into some of the collegiate prospects that Big Blue should thoroughly examine. The 49ers will certainly add a receiver or two to the top of their depth chart this offseason (like Antonio Brown, for instance), but there should still be plenty of opportunities for third-year player Trent Taylor. Taylor underwent back surgery in June, and while he ended up playing 14 games last year — compiling 26 catches for 215 yards and a touchdown — he says he never felt fully healthy. But as Jennifer Lee Chan of NBC Sports Bay Area writes, Taylor believes he is finally back to normal, and he thinks a regular offseason of work will prime him for a breakout campaign. He is also looking forward to working with his new position coach, Wes Welker, who certainly knows a thing or two about making hay as an undersized wideout. 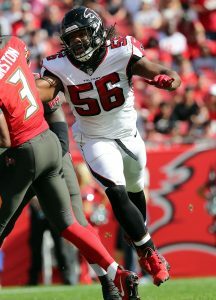 The Falcons recently re-signed linebacker Bruce Carter and defensive end Steven Means to one-year pacts, and D. Orlando Ledbetter of the Atlanta Journal-Constitution passes along the contract details. Carter will earn $930K (making his contract a veteran minimum deal), while Means will earn $895K. The minimum salary for a player with Means’ service time is $805K, but Atlanta gave him a $90K signing bonus. He will carry a $735K cap hit, while Carter’s cap number is $645K. It appears that Cardinals pass rusher Markus Golden will be allowed to hit the open market next month. The Falcons inked defensive end Steven Means to a new one-year extension, according to a team announcement. Means was initially set for free agency in March. Means, 29 in September, played in eight games (four starts) for the Falcons in 2018. In that span, he recorded 14 stops, three tackles for a loss, and one sack. The defensive end has traveled around the league since being selected in the fifth round of the 2013 draft by the Bucs, so this is a welcome bit of stability for him. Before coming to Atlanta, he also spent some time with the Eagles and had stints on the Ravens’ and Texans’ practice squads. 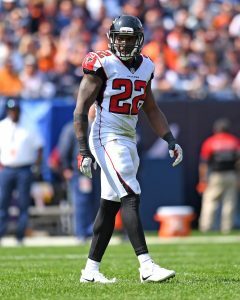 The Falcons have placed safety Keanu Neal on injured reserve and signed defensive end Steven Means, the club announced today. Neal suffered a torn ACL in Atlanta’s season opener on Thursday night and will subsequently miss the entire 2018 campaign. The former first-round pick had started 30 games over his first two NFL seasons, but he’ll now be replaced by 2017 draft pick Damontae Kazee. The Falcons could conceivably target a free agent like Eric Reid, or a trade candidate such as Earl Thomas, but there’s been no indication as of yet that Atlanta will head in that direction. Means, who turns 28 years old this week, was a preseason star for the Eagles, as he posted three sacks in the club’s final exhibition game. His regular season track record is much more spotty, as he’s appeared in just 26 games since entering the league in 2013. Means, who has spent time with the Buccaneers and Ravens in addition to the Eagles, will boost an Atlanta edge rush that already includes Vic Beasley and Takkarist McKinley, among others. The 53-man roster deadline is coming at the end of the week, but defensive end Steven Means won’t have to sweat it out. Means has inked a one-year extension with the Eagles that will keep under contract through the 2018 season. Means came to Philly in December 2015 when he was signed off of Houston’s practice squad. 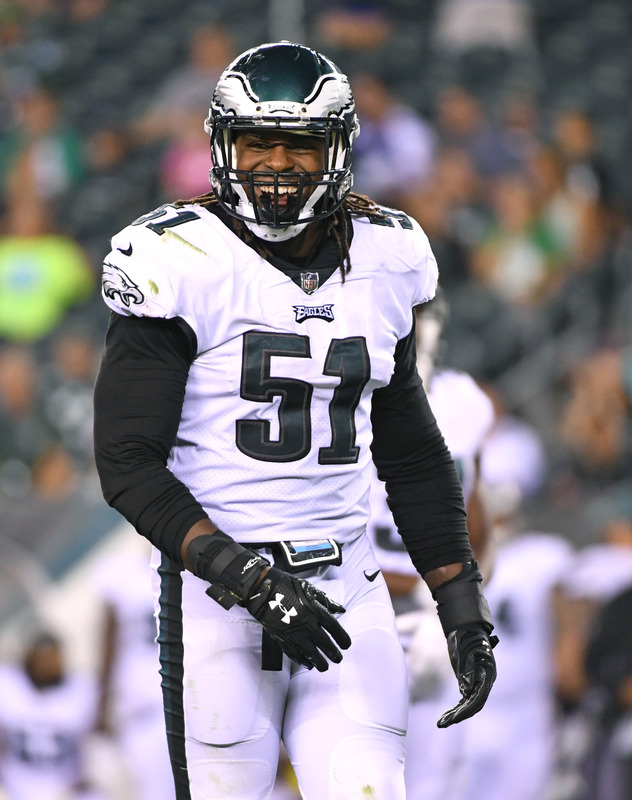 He made his on-field debut for the Eagles in 2016, tallying three tackles and one sack in eight games. After a strong offseason, Means could be seeing an increased role, though he’ll likely spend the bulk of his time on special teams. The latest roster projection from Roster Resource has Means as the No. 5 defensive end behind starters Derek Barnett and Brandon Graham and supporters Chris Long and Vinny Curry. The Dolphins have re-signed tight end Brandon Williams to their active roster, waiving safety Jordan Kovacs in a corresponding move, the team announced today (Twitter links). Miami also opened up another roster spot by placing defensive tackle Robert Thomas on the injured reserve list. Jets defensive end Mike Catapano has landed on IR due to a foot injury, with safety Ronald Martin getting the promotion from the practice squad to take his spot on the roster, the Jets announced today (via Twitter). The Chiefs are signing offensive lineman Jarrod Pughsley from their practice squad to their 53-man roster, tweets Terez A. Paylor of the Kansas City Star. The corresponding move to make room for Pughsley isn’t yet known. The Falcons have released defensive tackle Ricky Havili-Heimuli from their injured reserve list, the team announced today (via Twitter). He’ll become a free agent if he clears waivers. In the wake of Nick Boyle‘s suspension, and with Crockett Gillmore and Maxx Williams both battling injuries, the Ravens have added two tight ends to their roster. According to a press release, the club has promoted Konrad Reuland from its practice squad and signed veteran free agent Richard Gordon. Boyle was moved to the reserve/suspended list and cornerback Cassius Vaughn was cut to create space on the roster. The Bills have also made a change at the tight end position, promoting Nick O’Leary from the practice squad and cutting veteran Matthew Mulligan, the team announced today. Mulligan had played a role this season for the Bills as a blocker and special-teamer, making the move a little surprising. Joe Buscaglia of WKBW wonders (via Twitter) if another team – perhaps the Ravens? – showed interest in O’Leary, prompting Buffalo to protect him. The Eagles have signed outside linebacker Steven Means from the Texans‘ practice squad, the club announced today (via Twitter). Means will take over the roster spot vacated by Miles Austin, who was released on Monday. With a Thursday night showdown against Arizona around the corner, the Vikings have made a handful of roster moves, announcing in a press release that they’ve signed safety Shaun Prater and elevated safety Anthony Harris from the practice squad. To make room for the incoming defensive backs, Minnesota placed safety Antone Exum on injured reserve and waived defensive end Justin Trattou. The Colts are adding some depth at the linebacker spot by promoting linebacker Amarlo Herrera to their active roster, a source tells Stephen Holder of the Indianapolis Star (Twitter link). Jerrell Freeman and Nate Irving are banged up for Indianapolis. The Browns have re-signed offensive lineman Darrian Miller to their 53-man roster just three days after cutting him, placing fullback Malcolm Johnson on injured reserve in a corresponding move, per a team release. Today’s workouts and visits from around the NFL.. The Texans have worked out a pair of pass rushers in Steven Means and Gerald Rivers, reports Aaron Wilson of the Houston Chronicle. Means was previously cut by the Buccaneers, and recently worked out with the Chiefs. Rivers has had tryouts with the Eagles and Jets this month. The Jets worked out former Rams running back Isaiah Pead, Rich Cimini of ESPN.com (via Twitter). The Broncos worked out quarterback Seth Lobato in addition to tight end LaCosse, who both played for Northern Colorado, according to Troy Renck of the Denver Post (via Twitter). Field Yates of ESPN added a few familiar names who had workouts on Tuesday, such as cornerback Bradley Fletcher with the Panthers, running back Travaris Cadet with the Colts, and defensive lineman Da’Quan Bowers with the Vikings (via Twitter). The Panthers are working out tight end/fullback James Casey today, according to Mike Garafolo of FOX Sports (on Twitter). The Saints tried out defensive backs Akeem Davis and Robert McClain, wide receiver T.J. Graham, guard David Arkin, and center Ryan Seymour, according to ESPN.com’s Field Yates (on Twitter). Seymour was ultimately signed to New Orleans’ practice squad. The Jets worked out cornerback Jeremy Harris on Monday, according to Rich Cimini of ESPN.com (on Twitter). Buster Skrine and Marcus Williams are both uncertain for this week, so Gang Green is likely looking at Harris as possible insurance. The Vikings worked out former Ravens defensive tackle Christo Bilukidi on Tuesday, a source tells Aaron Wilson of The Houston Chronicle (on Twitter). The Panthers worked out former Ravens quarterback Bryn Renner according to a source who spoke with Wilson (Twitter link). The Broncos are working out former Titans linebacker J.R. Tavai, according to a source who spoke with Wilson (Twitter link). The Titans will try out ex-Ravens fullback Kiero Small, Wilson tweets. The Ravens tried out a trio of defensive backs: Jonte Green, Sheldon Price, and Cornelius Brown, Wilson tweets. The Chiefs tried out defensive back Trovon Reed, Wilson tweets. The Steelers worked out tackle James Brewer, Wilson tweets. Former Seahawks wide receiver Douglas McNeil is working out for the Panthers today, according to a source who spoke with Wilson (link). The Broncos working out tight end Matt LaCosse today, according to a source who spoke with Wilson (link).